Interview - Dhani Harrison of thenewno2: A Rock Royal Finds Himself In The Digital Age His father was a Beatle, but Dhani Harrison wanted a musical project that didn't carry the burden of his family name. So he started a band called thenewno2, where he's created a sound and a promotional strategy that is all his own. Dhani Harrison was on track to become a race-car designer before his father's death in 2001. But when he stepped in to help finish his dad's posthumous album Brainwashed, the life of a musician seemed like the way to go. 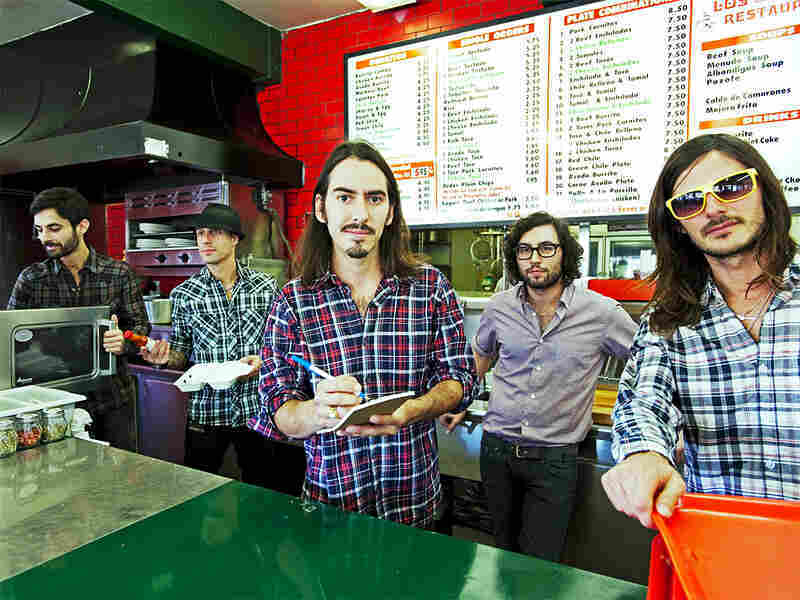 thenewno2 is led by guitarist and singer Dhani Harrison (center) with drummer Oli Hecks (right). Dhani is, of course, the son of The Beatles' George Harrison. He looks exactly like his father around 1967: the hollow cheeks, wisps of facial hair, deep brown eyes. But his sound is something completely different — and he also took a less orthodox route to making and distributing his music. He quietly built a solid and loyal following online, and started releasing his music through iTunes and the video game Rock Band. But he didn't do it under the name Dhani Harrison — this was with his band thenewno2, whose debut album is called You Are Here. "I was looking for a name of a band that was, you know, faceless," Harrison tells NPR's Guy Raz. "Just as a way of people being able to see the work we were doing for what it was before they realized that there was any sort of attachment to any Beatles stigma, or whatever you want to call it — just as a way of getting the art seen without having to 'fess up instantly." Harrison says he was fortunate to inherit his father's studio, so that by the time thenewno2 came together, he already knew how to make records. He says that gave him the liberty to try out new business models. "Thenewno2 is sort of my little prototype band, really," Harrison says. "And it's a good way of demo-ing different systems so that if anything does work, we'll help the new model. Or at least shame the old one." The band recently redesigned its Web site so they can update it with their mobile phones and host interactive chats while on the road. "I suddenly realized that in order to do what I wanted to do, I had to become that which I hated — which is the head of a record company or a digital media conglomerate — and just do whatever you want," Harrison says. Harrison tells Guy Raz about modern information overload, working on the Beatles edition of Rock Band and lessons learned from his father. "I think part of his whole thing was to really never enforce, inflict any opinion on me, other than the important stuff of spirituality, self-realization, working on who you are, where am I going, what am I doing, who am I," Harrison says. "Those were the important issues. He never really taught me how to play guitar — he just let me go. He never really taught me how to write a song, but I was always there with him. And I think there's no way of teaching someone how to do these sort of things — it's just, if you're fortunate enough to be headed down that path, then you gotta find your own way. "No, he'd say to me, 'Never be famous, and don't play music.' But you know, I didn't listen to that one."